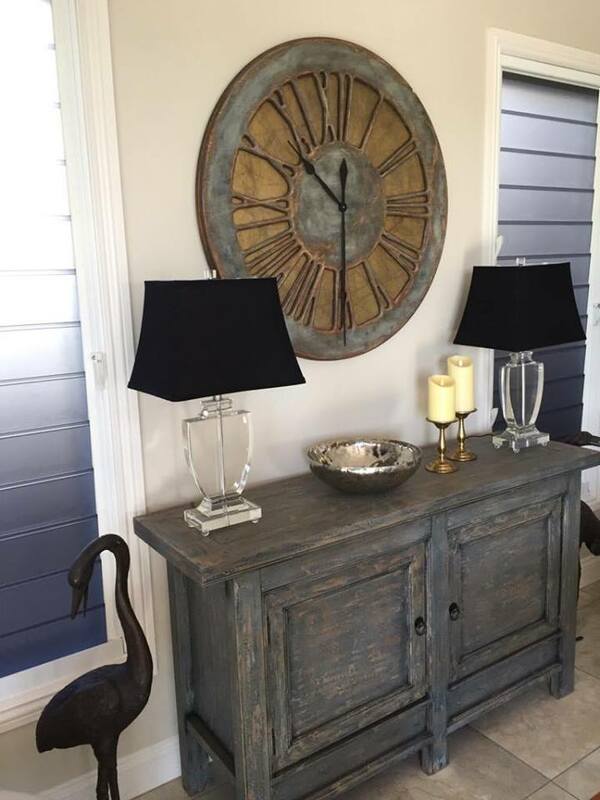 Large Wall Clock for Living Room. Handmade work of Art. Best large wall clock for living room you can find on the market. 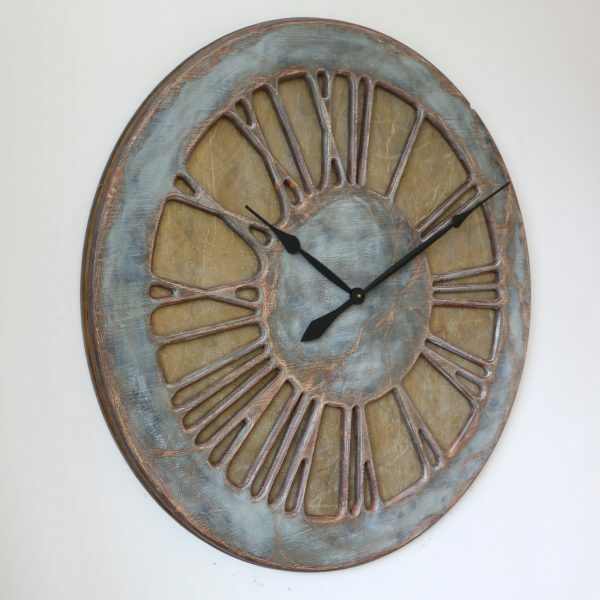 It is handmade and displays large roman numerals on a golden background. Have you been looking for something that doesn’t only tell the time but is also a true feature in your house? At Peak Art we specialize in handcrafting large timepieces that are tailored to your requirements. 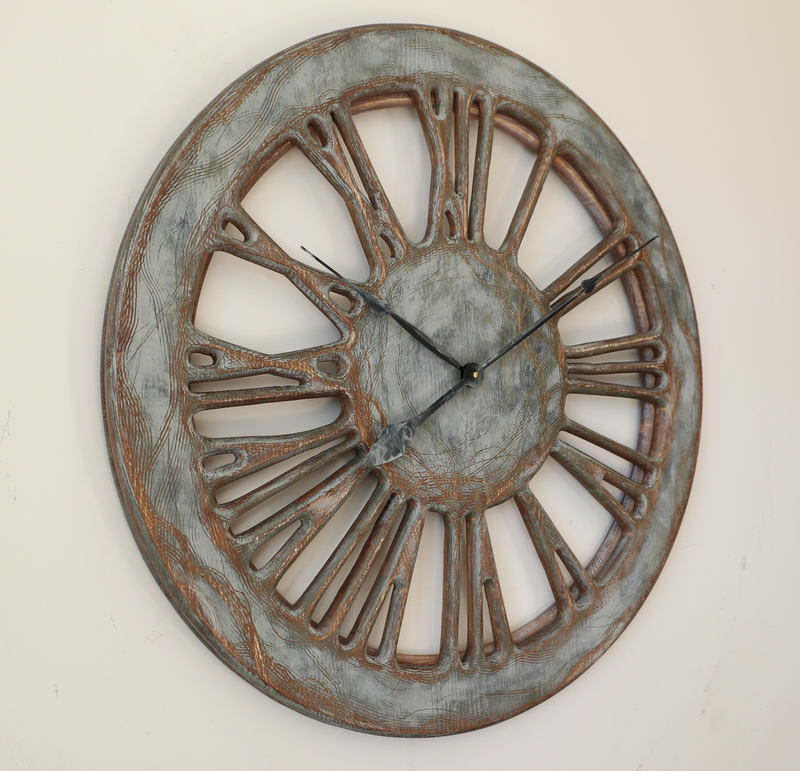 We can customize this beautiful wall clock to make sure it works in your interiors. Depending on your available wall space we offer three different sizes. 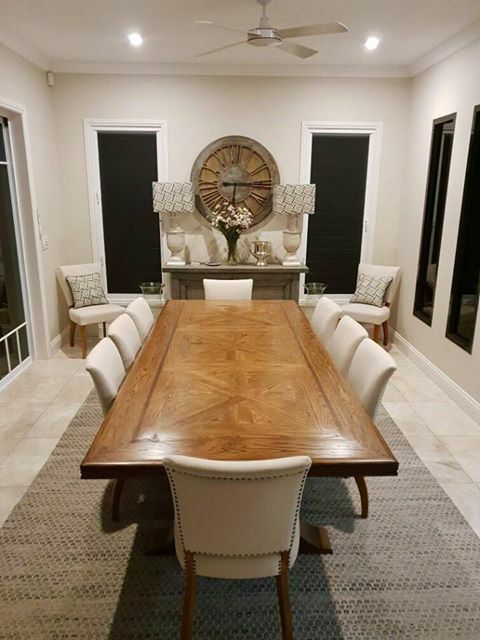 Are you looking for a large wall clock for your living room? When you look at this most sophisticated handmade clock design you can’t help yourself but say “wow, what an amazing piece of art”. At Peak Art every single timepiece is globally unique, one of its kind. This is the main reason why people looking for large wall clock for living room often come to us. Are you interested in something that you can’t find in a shop window? Maybe you want something so eccentric that it can become a topic for many conversations around the dinner table? Whatever you need please join thousands of people in Peak Art Facebook Community. You can share your views and comments to help us provide more unique designs tailored for your needs. 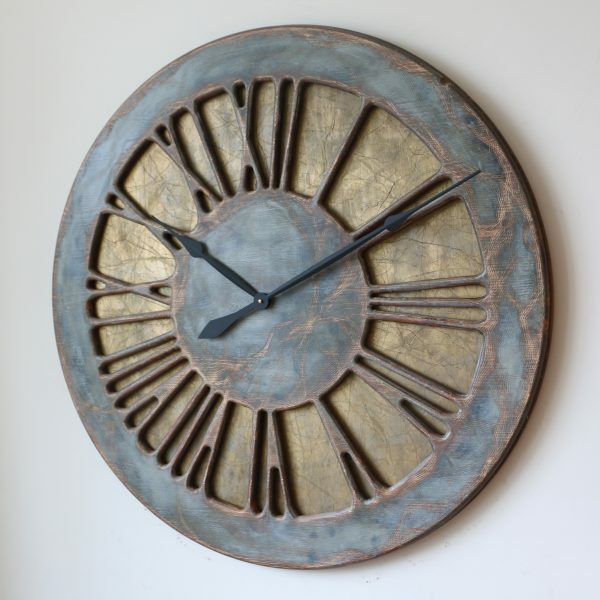 “Classic Rustic Grey” is a centrepiece roman numeral clock with grey, blue & gold theme. 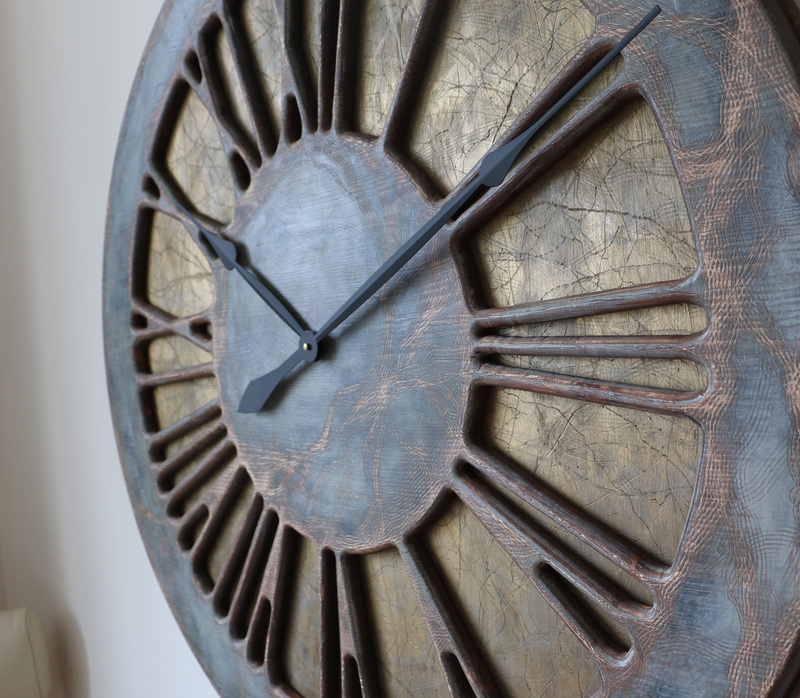 The clock face is cut out of single large panel of pine wood and beautifully hand painted. The golden background adds more charismatic look. It also provides a strong statement to anyone coming across it. 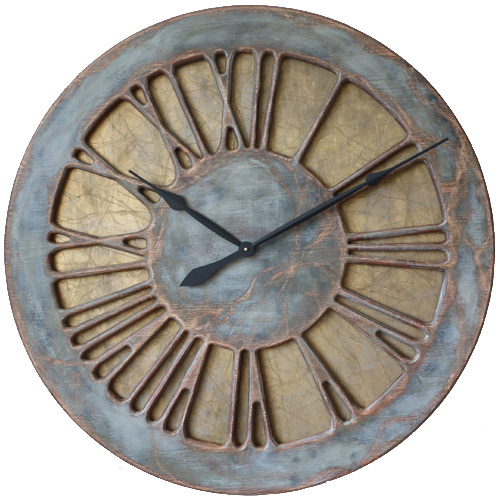 This idea to use large wall clock to decorate your living room isn’t new but at Peak Art we take it to the next level. We don’t mass produce those remarkable timepieces like 95% of other companies. 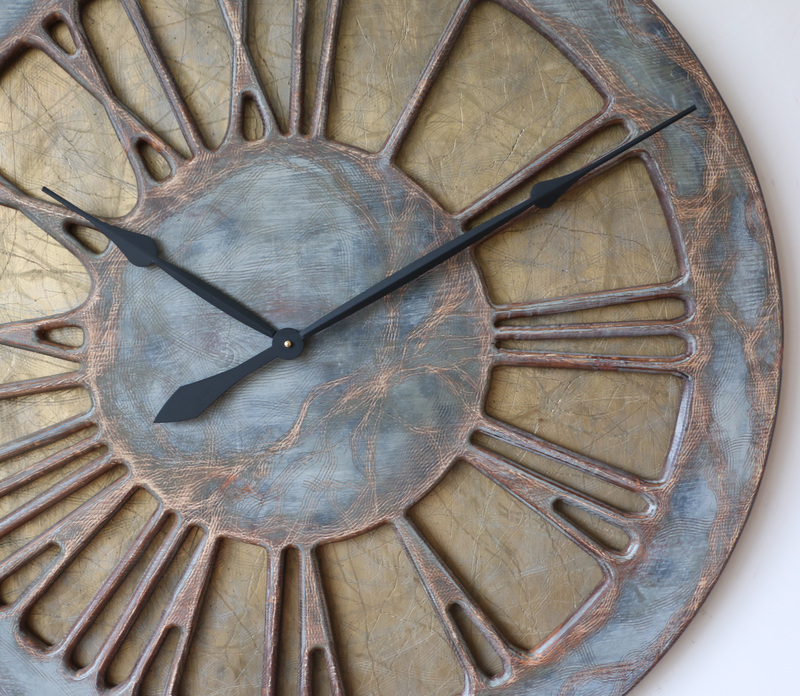 As a small family business we hand craft every single clock whichever size you chose. 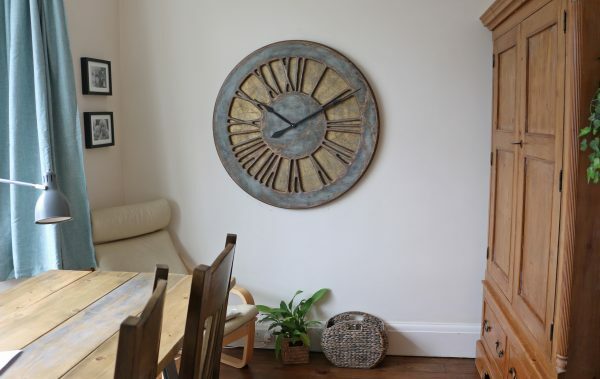 Depending on how much space you have available we can offer medium, large or even extra large wall clock for your living room. Do you think you need to drill the walls to provide electric power to our oversized timepieces? Don’t worry about this because all of them just require a single C-Cell battery which lasts up to 12 months. The most powerful quartz sweep movement is a silent mechanism that we selected as the best on the market. We deliver each clock with both hands detached to prevent any damage in transit. When you place the order you can stay assured that you will get personal email with all the information including youtube video explaining how to attach the hands and set the time. 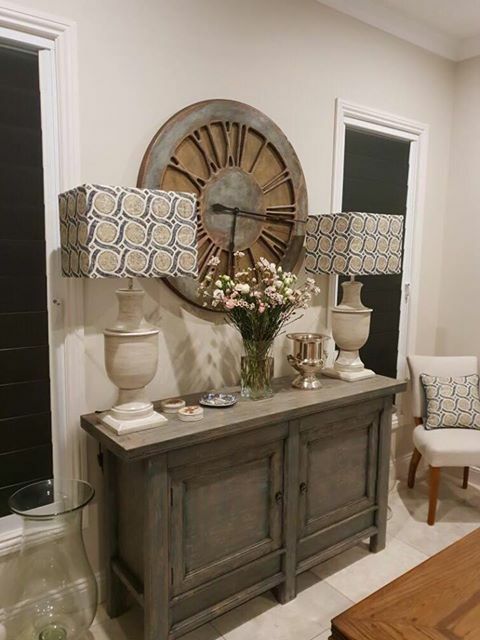 If you are wondering how our handmade clocks can look in your place please check our gallery showing various arrangements. Although roman numeral designs are most common, we have many different shapes and sizes available. As always we want to ask you to contact us directly if you can’t find the design that fits your needs. We have designed personalised clocks for many customers around the world and you can be next.